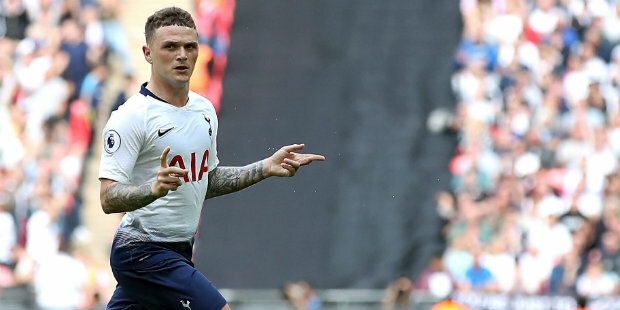 Kieran Trippier is among 12 players who could leave Tottenham this summer and Aaron Wan-Bissaka could be lined up to replace him, according to the Evening Standard. The Standard say England international Trippier would go if the right offer comes in and that Serge Aurier could also leave. That would pave the way for another right-back to come in – and Crystal Palace star Wan-Bissaka continues to be linked with top clubs after hugely impressive performances for the Eagles. According to the Standard, Jan Vertonghen, Danny Rose, Toby Alderweireld, Vincent Janssen, Fernando Llorente, Georges-Kevin Nkoudou, Victor Wanyama, Erik Lamela and Moussa Sissoko could go. And there remains speculation over the future of Christian Eriksen, whose contract talks remain deadlocked. Meanwhile, AC Milan are reportedly keen on Tottenham boss Mauricio Pochettino. Be the first to comment on "Tottenham will consider offers for 12 players and want Crystal Palace star"